Up until a week ago, the sons had never taken a single bite out of a Brussel sprout. Still, they had an instinctive hatred of them, refusing to try a single bite of their side of ‘roasted’ Brussel sprouts they were served with dinner. Yet, how can I blame them? Up until this recipe last week, I too had always steered clear to them, to the point or stubborn out-right refusal of even considering to try them. Even when my mantra to the sons is try new things. Brussels sprouts probably have the worst reputation of any vegetable. As you’ve seen, they’re the classic example of the vegetable hated by both kids and adults, only eaten because they’re so good for you. However, we were able to use this awesome recipe to change our whole familiys’ minds. A lot of the issue with people who have tried Brussel sprouts and hated them, is that they are a naturally bitter vegetable. And I do mean, bitter! However, roasting them (whether in a pan as in this recipe, or even in the oven) allows the sugars to break down and caramelize, nicely balancing out and breaking down their originally bite. 1. Clean the brussel sprouts by trimming off the ends and peeling the outer layer of the sprout off. Cut each one in half. 2. Heat the butter in a large skillet over medium high heat. 3. Once heated, add the halved brussel sprouts to the pan and saute for about 8-10 minutes on each side until the outer part is a caramelized brown and the inside is soft and fully cooked. 4. Add the garlic half way through the cooking. 5. Reduce the heat to low and add the lemon juice, salt and pepper. 6. Stir to combine and taste. Adjust seasonings if needed. Add the cheese on top and serve. Note: So if you need to convince someone stubborn to like Brussel sprouts or it’s their first time trying them; the best way to have brussels sprouts is to roast them, and this is the only recipe you will ever need. 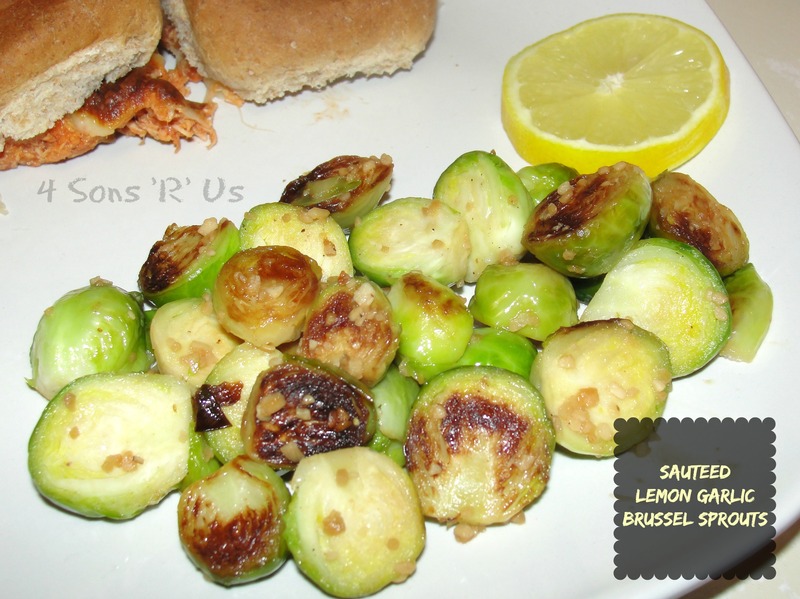 Posted in Recipes and tagged Brussel sprouts, dinner, lemon juice, recipe, side dish. Bookmark the permalink. Posted in Recipes and tagged chicken broth, enchilada sauce, homemade enchilada sauce, recipe, red enchilada sauce, Red Enchilada Sauce recipe. Bookmark the permalink. This week we’re introducing Sous Chef Sundays! 2-3 Sundays a month we will be bringing you kid friendly recipes that one or more of my own 4 sous chefs have helped me create & prepare. Tried and true dishes that we’ve made sure are appropriate for getting your own kids in the kitchen and involved. 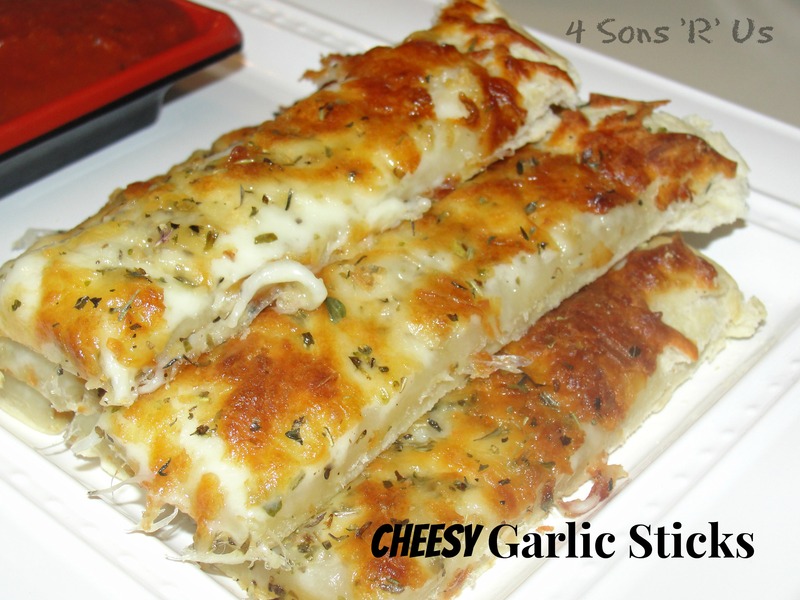 This week we’re introducing you to Cheesy Garlic Sticks. The sons love these! They know it’s going to be a great day if they see pizza dough thawing before they leave for school and ‘pizza’ isn’t on the dinner menu. That’s guaranteed to mean these oh-so-yummy breadsticks will be waiting for them when they walk in the door after school. 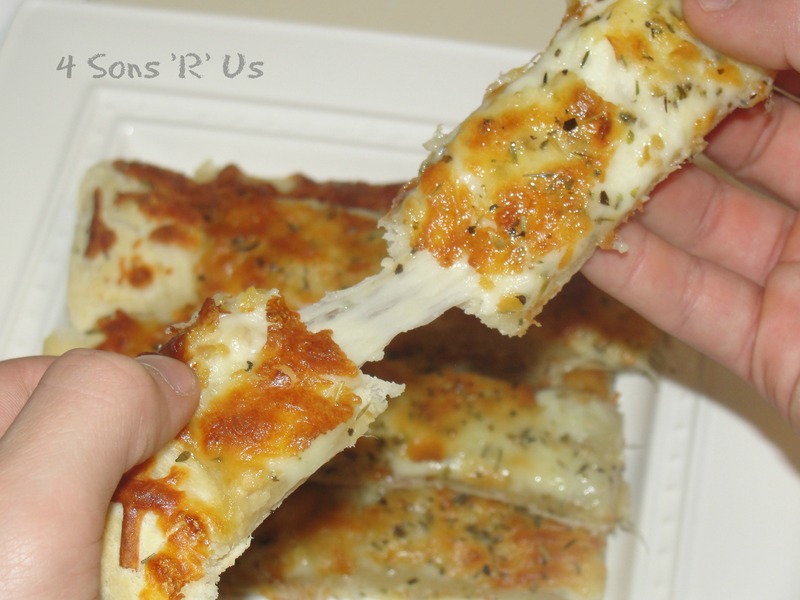 These come out piping hot with that perfect amount of stretchy, melted mozzarella. Son # 4 (4) enjoyed using a rolling pix to stretch the dough out (by himself) into the pan and sprinkling cheese everywhere. And I do mean everywhere, but it was kind of freeing to just go with it and see his little face lit up with joy. I also reminded myself I could fix it to my satisfaction before we actually put it in the oven. 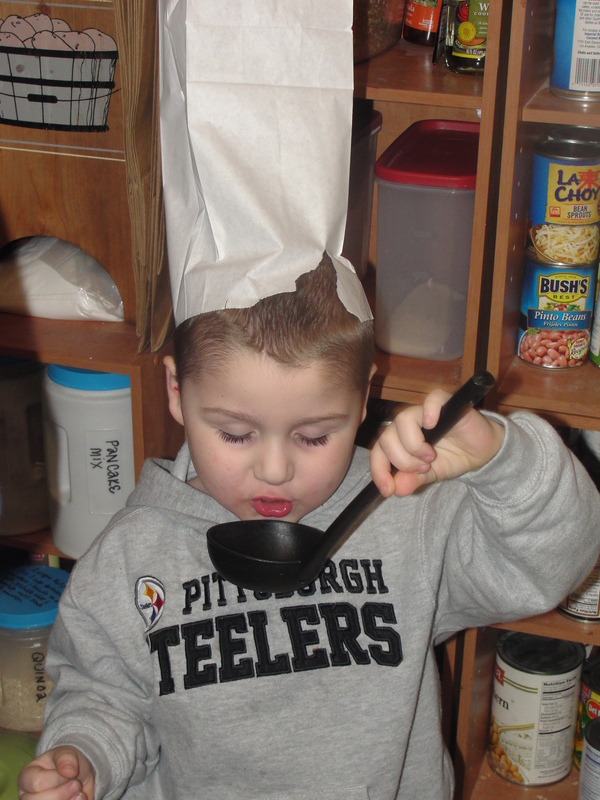 Son # 4 insisted I ‘hold on’ when it was time to start on this recipe. I patiently waited as he climbed up on his step stool and grabbed a white paper lunch bag. He then ran into his room. This is how he came back into the kitchen. Ready to rock! 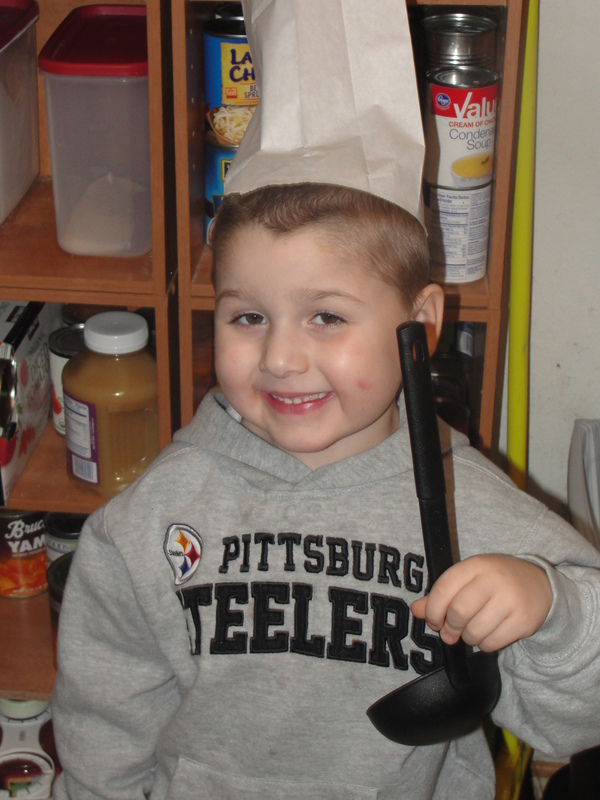 The little ‘chef’ had even found his own photo prop! All cuteness aside, let’s dig into this Sunday’s recipe. 1. Roll out pizza dough on a baking pan. Brush dough lightly all over with olive oil. 2. Sprinkle shredded mozzarella and provolone, if using, all over the dough. Use your fingers and sprinkle minced garlic all over the dough. Sprinkle Italian seasoning on the top, as desired. 3. Bake at 425 for 12-18 minutes. 4. Let sit for 5 minutes before cutting. Use a pizza cutter to cut into breadstick-sized strips. Serve with marinara sauce, if desired. Posted in Recipes, Sous Chef Sundays and tagged pizza dough, recipe. Bookmark the permalink. 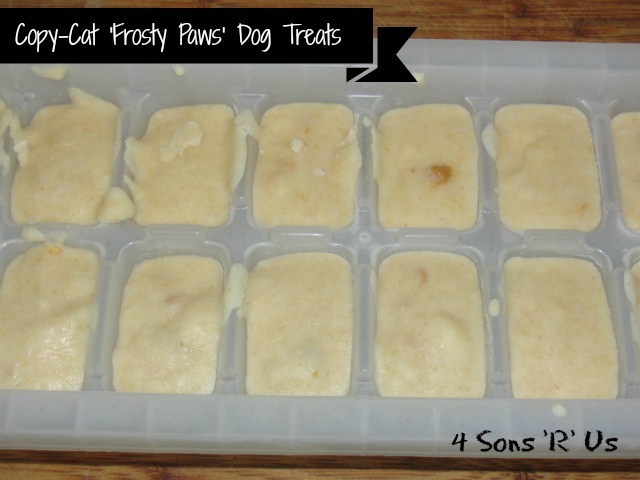 Posted in Pet Supplies and tagged copy cat, diy, dog treat, frosty paws, frozen, recipe. Bookmark the permalink.